The BBC's online services have suffered a major outage, just weeks before the BBC confines its youth service to an online-only service. Internet users lost access to the BBC's online services earlier this morning, leaving viewers without access to the iPlayer and other popular webpages. The BBC confirmed a 'technical issue' that it was working hard on resolving. By late morning, some pages began to reappear, although users continued to report frequent "Error 500" messages. A reason for the outage has not been provided, although there's a lot of unfounded speculation circulating the web. 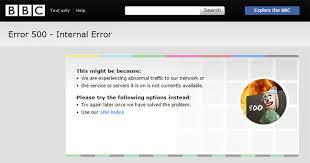 It's the first major fault for the BBC website since July 2014, when the iPlayer went down. Update: In the meantime, BBC News has confirmed that the problem was due to a massive attack, whereby the BBC websites were swamped with more traffic than it could handle. Who was behind the attack has not been disclosed. Earlier this month, British universities suffered a similar attack. BBC radio news says it was a DDOS attack.